Members of the West Carleton Arts Society have been invited back to the Herb Garden Art Gallery again this year. Submissions are accepted now until May 1st. Click here for more information and to apply. Click for more details on this new venue. 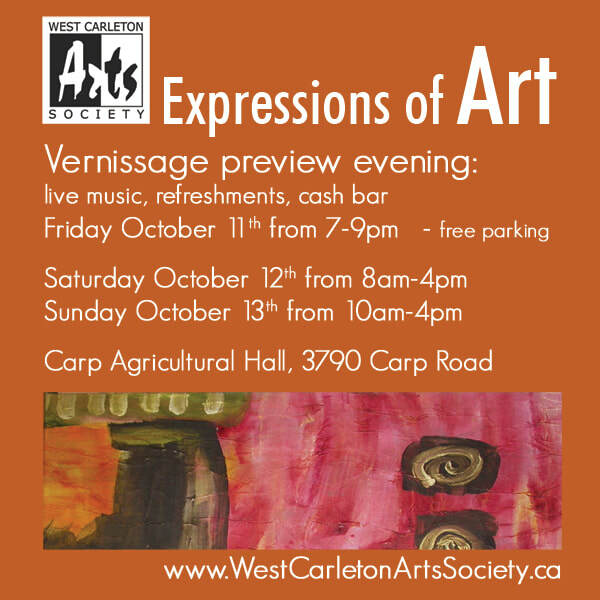 West Carleton Arts Society Fall Show and Sale ‘Expressions of Art’ will be held on October 11th, 12th & 13th, 2019 (Thanksgiving Weekend) in the Carp Agricultural Hall, Carp Fairgrounds, 3790 Carp Rd. This show is open to WCAS members only. The annual membership fee (Jan. to Dec) is $30. Fine Art and Fine Crafts. For application forms, booth fees and show guidelines click here. Deadline for application for selection is June 1, 2019. Anne Heather Moore – annemooreart@gmail.com. Plant Bath Wall Space "More or Less"
All artwork on display is for sale. West Carleton Arts Society have partnered to hang original artwork throughout the library in Carp and Constance Bay. Works of art are hung in the public areas. Every few months a different set of work is displayed. All labeled artwork is for sale. Click to learn more about these rotating art shows. The Juke Joint Soul Kitchen has chosen the Village of Carp as it’s home. Great food and great atmosphere are trademarks of this place. The Juke Joint Soul Kitchen is displaying for sale works by artists from the West Carlton Arts Society. Click for details on Renting Grids from West Carleton Arts Society, now conveniently available from the Dymon Storage in Kanata. FOLLOW Plant Bath Wall Space/Ottawa on Facebook. FOLLOW Carp Library "Art on Display" on Facebook. FOLLOW WCFHT "Art on Display" on Facebook.